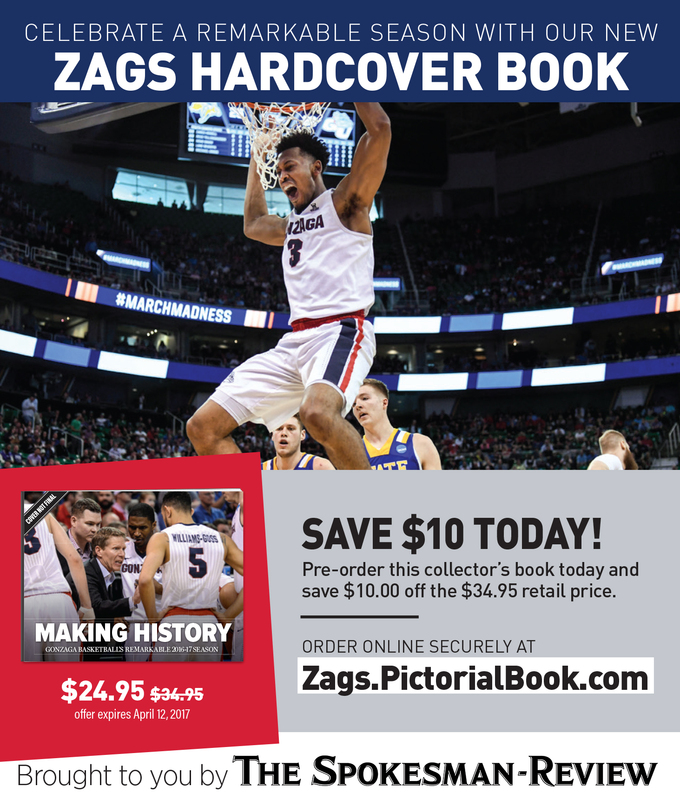 UPDATED: Tue., March 28, 2017, 11:08 p.m.
Gonzaga had thousands of fans show up last week to watch the Zags clinch a spot in the Final Four. Even the Zags’ biggest fans – the ones that were sitting right behind them – made sure to get to San Jose, California, for Gonzaga’s historical win. Several of the Zags looked back and saw their family members, significant others and close friends sitting in a designated section in the stands right behind Gonzaga’s bench. For some of those family members, being able to watch their Zags up close and personal was a rare event. And that should always be the goal for any college basketball player – to keep playing in the tournament every year. At least that’s what Jordan has told his younger brother since the beginning of the season. Jonah said Jordan has been vague when it comes to his experiences as a college athlete, only because Jordan wants his brother to experience the lifestyle and understand the hard work that it takes to succeed as a student-athlete for himself. But Jordan has offered a few pieces of advice to his brother to help him get through his first year on the college court, which includes focusing on grades and blocking out the noise and outside criticism that often surrounds college sports. According to Jordan, Jonah seems to be handling the hectic lifestyle just fine and has already proven himself on the court. This year, Jonah played in 35 games and started in three. He average about 20 minutes on the court and 7 points per game. Jonah said he was able to see Jordan play one other time earlier in the season when snow kept his team in the Spokane airport while traveling between games. The two brothers get to watch each other regularly on television, though. Since their games didn’t often conflict with each other this year – Jonah played quite a few games on Wednesdays and Sundays and Gonzaga’s games were mostly on Thursdays and Saturdays – the brothers were able to keep up with each other throughout the season. Jordan was accompanied by several other family members last week, including his parents, his sisters and his best friend. The guard admitted it was a little strange looking behind him and seeing all those familiar faces so close to the court, but he was glad they were there for him. Published: March 28, 2017, 7:17 p.m. Updated: March 28, 2017, 11:08 p.m.